Something significant is going on in the world of pizza. It's happening in Italy and rippling out in waves of deliciously puffy, aerated golden dough to the rest of the world. It's fascinating that it's emanating not from its spiritual home of Naples but from outside the confines of the city that invented this delicious wheel. I've been researching pizza in Italy for many years now and I've noticed a huge change in the way it is made at every step of the process. 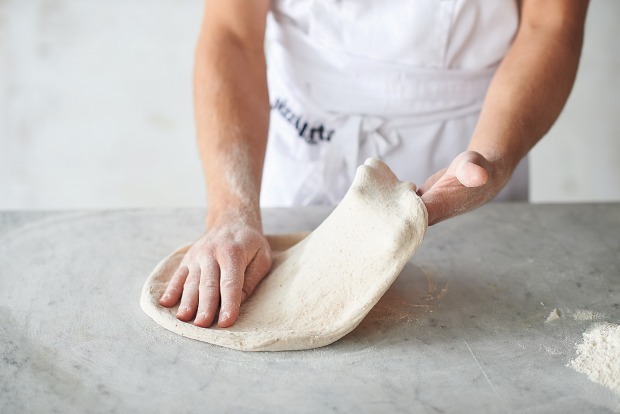 This change has been led by chef-pizzaioli whose curiosity and eye to quality has taken them back to the fundamental building blocks of pizza making, from the growing of the grain and the milling process to temperatures, fermentation and maturation times for the dough. Where has this change in pizza making led us? 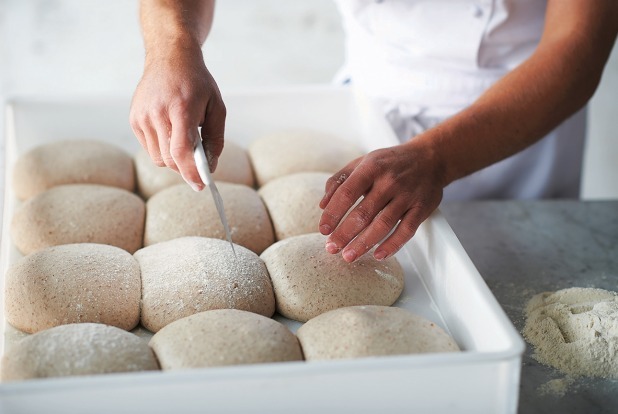 Much like the recent movement away from industrial white bread toward artisan loaves with natural leavening and specialist flours, it's honouring the past as well as taking forward steps. 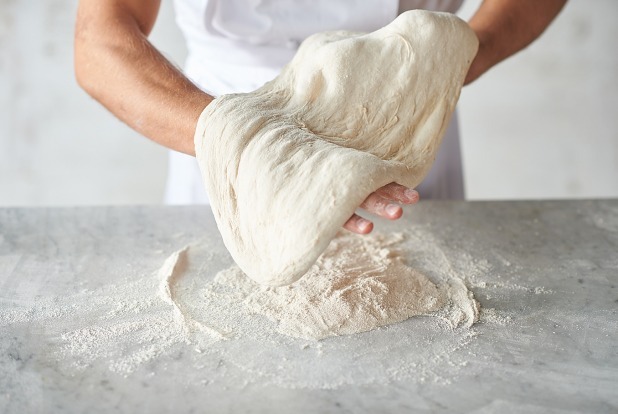 It's a movement back to pizza's origins, before industrial flour milling, while at the same time using modern advances in stone milling, machinery and oven technologies. This step forward in pizza making has by necessity taken place outside Naples. If you look closely in pizza kitchens in Naples you'll find that many of them use highly refined "00" flour as stipulated by the various associations set up to standardise Naples-style pizza. This flour is relatively cheap, has the consistency of talcum powder and the refining process removes the wheat bran and germ. Now, there is nothing wrong with this and the use of "00" flour more or less defines the "Naples-style" pizza as we know it today but what happens when you use different flours, free of these regulatory strictures? What can be achieved when these flours are then used in different types of fermentation procedures? These are some of the questions I explore in my book, New Pizza. After all, even when pizza first appeared in Naples in the first half of the 18th century, it would be over a century before the introduction of the steel roller mill. 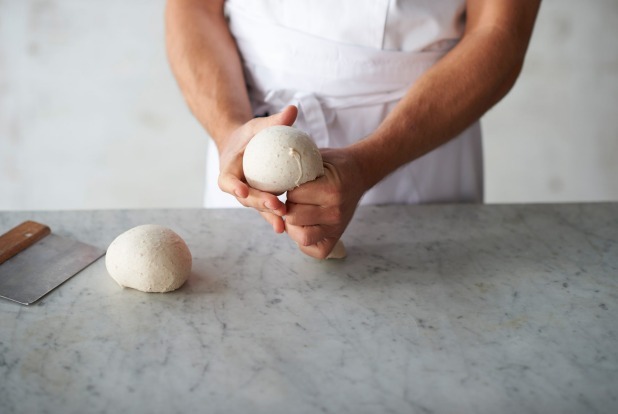 So, for at least a hundred years, stone milled flour was used to make pizza. Granted, the bran was partly sifted out even back then but the grain was milled in its entirety, and this is fundamental to its structure. The roller mill brought us white flour. White flour means uniformity, consistency and less technical ability on the part of the user. As well it means that, without the essential oils contained in the germ, flour lasts a long time. It can be exported and can be used to make a standardised product around the world. But industrial doesn't always means "bad". It denotes a repetitious process with consistent results, nothing more nothing less. 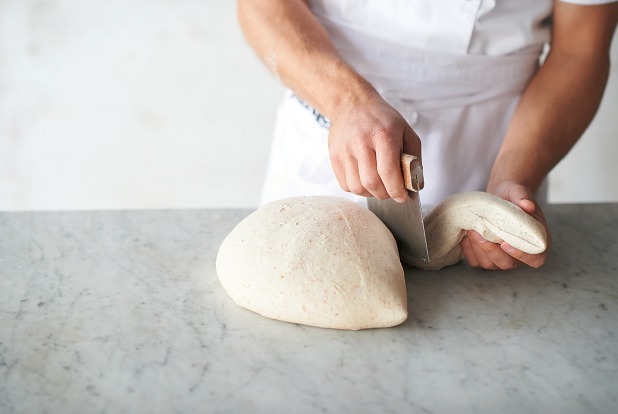 There are many pizza makers making outstanding pizza with roller-milled flour. But there is a whole new world of pizza making that can be explored with flour containing various degrees of bran and germ. 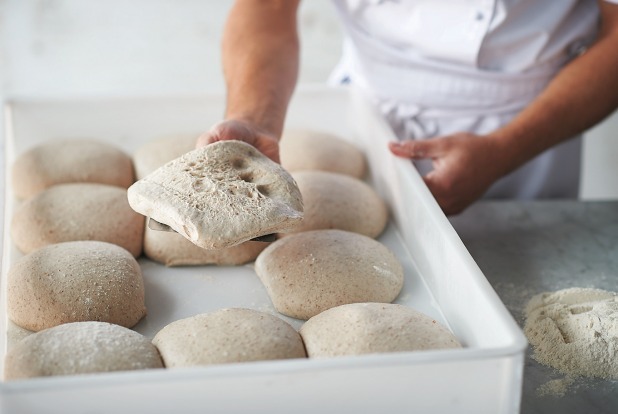 This leads us to fermentation, the seemingly mysterious process where flour, water and yeast are mixed together to make dough that rises, increases in volume and transforms as it cooks to something rather special. 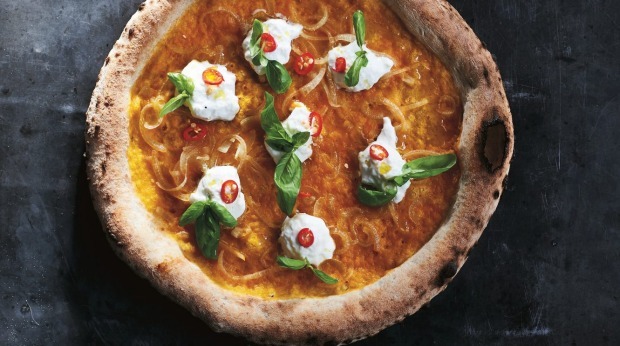 To achieve this pizza nirvana, dough needs time at lower temperatures. When we begin to make dough we are applying heat during the kneading process. This activates the yeast and it begins to feed on the sugars and complex carbohydrates contained in the flour. The more heat, the more voracious their feeding. If we slow down the rate at which they feed by placing the dough in the refrigerator, the conversion is slow, gradual and complete, resulting in long, elastic gluten strands that trap the carbon dioxide given off during fermentation. It makes those bubbles that are so important in making our pizza light and puffy. 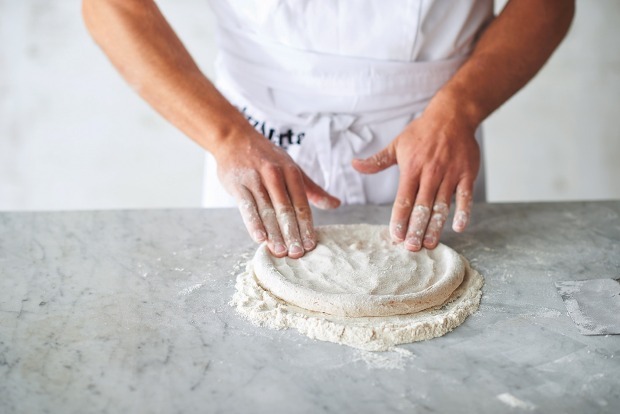 When you are ready to start, remember that the quality of a pizza is defined by the quality of the flour used, the correct method of fermentation and maturation of the dough, the correct temperature and cooking time, as well as the quality of the ingredients used to dress it. Pizza napoletana is defined by the local associations and conforming to various strictures like the exclusive use of 00 flour. Also included in this category is the folded calzone and pizza a metro (also called pizza alla pala) and, as the name suggests, it can be a metre or more long. 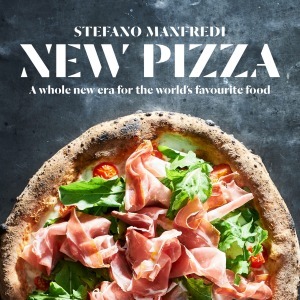 Pizza all'Italiana: This is a catchall that allows for regional variations for the round style pizza from the thin, crisp, cornice-free Roman to the thicker, pan-cooked northern permutations and the southern styles that are using rediscovered wheat varieties, including durum wheat. As there is less pressure to conform in this category, diverse flours and fermentation methods can be employed. 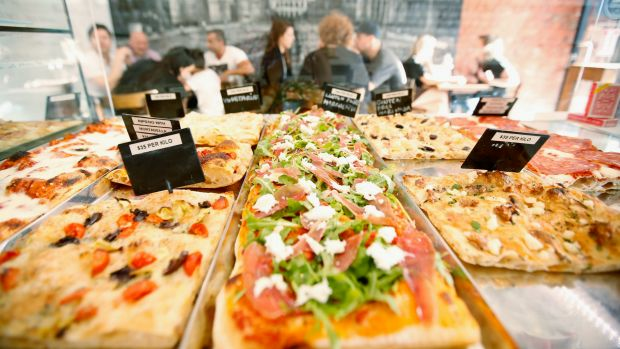 Pizza al taglio: Popularised in Rome, increasingly seen in the rest of Italy and soon around the world pizza al taglio is a large, rectangular focaccia-like pizza. It is generally cooked at a lower temperature than the round pizze, in an electric deck oven rather than a wood-fired or gas oven. It's crisp on the base and crust and soft and airy inside. Because it is thicker than a round pizza, it can support a much wider variety of topping. It is cut with scissors into quadrilateral slices and sold by weight. Pizza a degustazione: As the name suggests, it's a series of courses using slices of pizza, often of diverse flours/fermentation/style with changing topping or filling. It is prevalent at top end pizzeria/restaurants in Italy but has yet to take off outside the peninsula. It is where much of the experimentation and breakthroughs is happening. 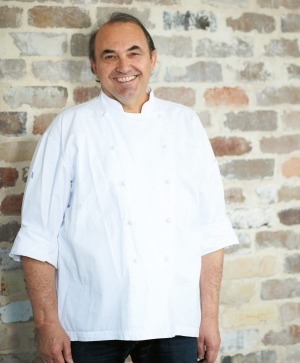 My chef-pizzaiolo, Gianluca Donzelli, and I have presented one such dinner and we are planning some others. Pizza fritta: Fried pizza is a Neapolitan specialty and needs its own category. Traditionally made with dough that has "expired" or reached the point where it isn't very active, it's stretched thin and filled with all manner of ingredients before being deep-fried in oil. Pizza fritta is very popular as a street food in Naples, especially at lunchtime. It's becoming more widespread in other parts of Italy though not often seen in Australia. 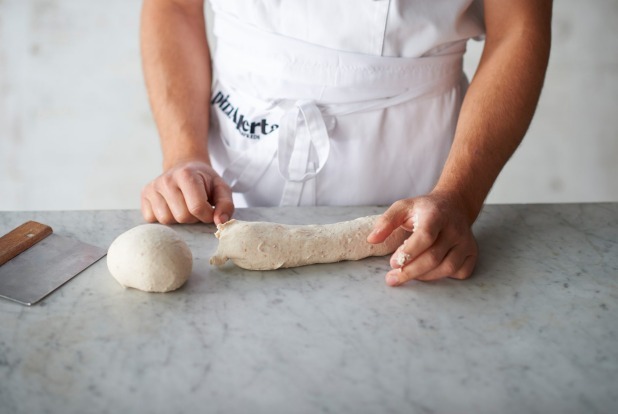 Many recipes for pizza dough will stipulate "00" flour pointing to the Italian classification of flour grades. This "00" grade is the finest on the scale and going up in coarseness 0, 1, 2 and finally wholemeal or "integrale". But this grading is only part of the story. The other consideration is flour's strength or, to give it its full name, its "working gluten strength" or W quotient. It's a numerical value that measures tenacity against extensibility of flour when mixed with water in dough. 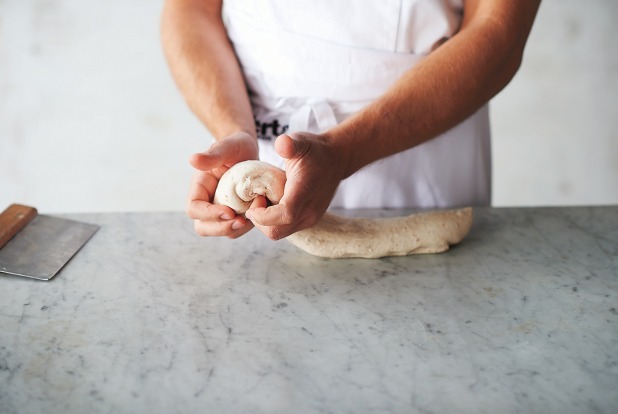 Put simply, it's how much you can stretch dough before it breaks. 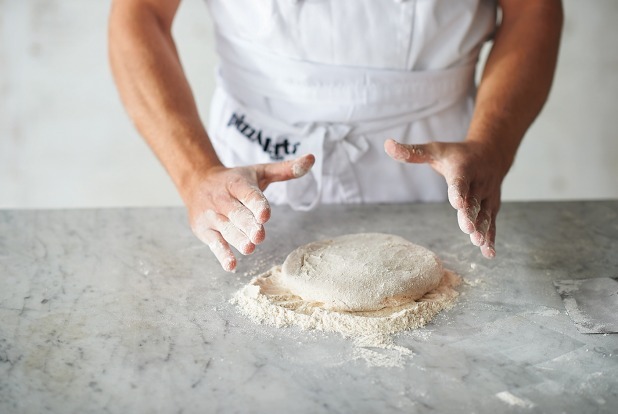 For pizza and bread making generally, strong flour is needed. My preference is for stoneground wholewheat flours that are milled as type 1 and 2. Wholewheat differs from wholemeal in that it has a percentage of the bran sifted out. Don't confuse the two. Stone milling produces flour from the entire grain – endosperm, germ and bran – it retains all of its protein content, rich in fibre and gluten. 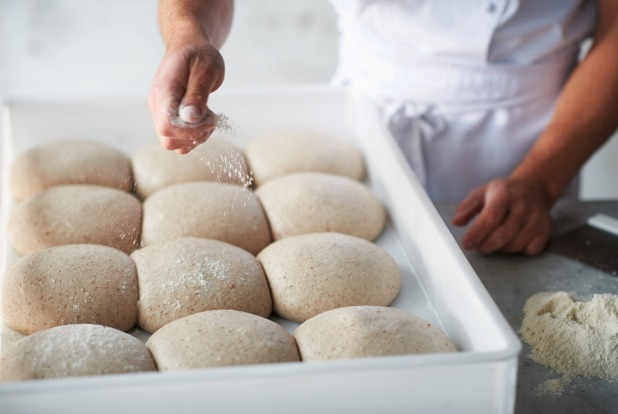 These flours produce doughs that, when cooked, are a little darker than pizza made with highly refined "00" but are fragrant, tastier and, when allowed to ferment and mature properly, are easily digested. If you can't find stoneground flour use a strong unbleached baker's flour. Kialla Pure Foods (Organic Grain Millers Queensland) – They produce a strong, unbleached bakers flour made from Australian wheat. For retailers nationally look on their website kiallafoods.com.au. The tomato topping: I use tinned Italian San Marzano tomatoes (available from Italian grocers). 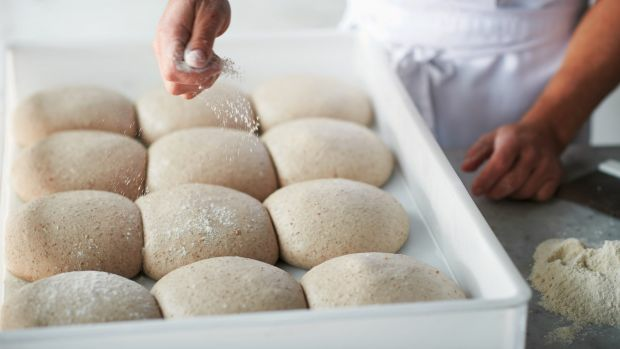 The direct method for producing dough is the easiest because all ingredients are mixed together, at about the same time, in a single dough. 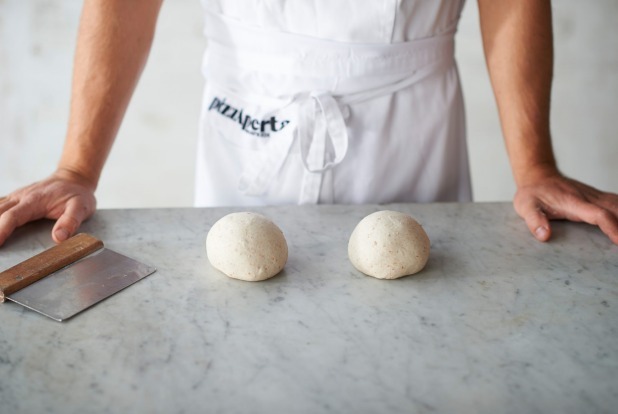 This is the method that the large majority of pizza makers use because it's simple and quick. In this recipe however, we are extending the maturation phase of the dough in the refrigerator so the final cooked pizza is easily digested and the flavour of the wheat is maximised. If you'd like to attempt an advanced indirect method it's outlined in my book New Pizza. 1. Place flour in a mixer bowl with a dough hook attachment. Turn on low to medium speed and add 500ml of water. Keep mixing until the water has been absorbed but the dough is still rough. Turn machine off and let sit for 20 minutes. 2. Dissolve yeast in remaining 50ml water. Turn mixer on to medium and add the dissolved yeast, mix for two minutes, then add the salt, mix for two minutes more, and finally add the olive oil. Keep mixing for another six minutes at this speed. Turn the speed up a little and mix for two minutes more. A good way to check elasticity is to stretch a piece of dough and if it forms a strong, transparent membrane (similar to blowing a bubble with gum), without breaking, it is ready. 3. 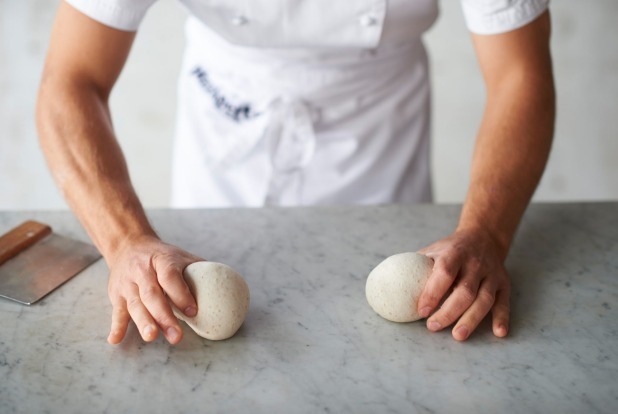 Let dough sit covered in cling film for 30 minutes in winter or 15 minutes in summer before forming the dough balls. 4. Form dough balls of around 250g each. Place balls on a high sided non-stick tray and cover with cling film but make sure the balls don't touch the cover. Let sit to rise for 60 minutes at 20-24C. 5. After resting, place in refrigerator for at least 12 hours and up to 18 hours if possible. Remove from refrigerator and leave at ambient temperature for two to four hours (less in summer and more in winter) before shaping to make your pizza (see step-by-step gallery above). 6. Before beginning to prepare the pizza, the oven has to come to temperature. Shape the pizza using a little flour and add the toppings of your choice. 7. 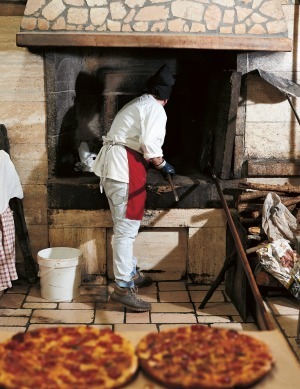 In a wood-fired oven, with floor temperature between 360-400C, a pizza will take around 90 seconds to cook. The pizza is put directly onto the oven floor to cook, thereby getting an immediate "lift". In a domestic oven, my suggestion is to find a large terracotta tile that fits onto an oven rack. Place the rack on the bottom rung of your oven and the tile on top, giving you plenty of room above to manipulate the pizza. Turn to full heat without using any fan-forced function and let oven run for at least 20-30 minutes to heat the tile completely. 8. When the pizza is ready, use a floured paddle to take it from the bench onto the tile. Close oven immediately. At around 250-280C your pizza will take five to eight minutes to cook, depending on your oven temperature. It will have a crisp, bread-like texture no less delicious than the wood-fired version. Makes 6 pizzas at 250g each.